Mt. 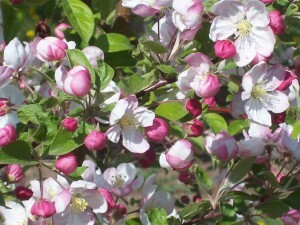 Evereste™ is an early blooming crab apple that blooms a couple of days later than Manchurian. Mt. Evereste™ produces an abundance of bloom with good pollen compatibility. The selection has low susceptibility to mildew and fireblight and, due to its low vigor, can be easily planted into high density plantings.